The Customer Care team are preparing for a very busy Christmas and New Year. With the support of our promoters and our RapidScan entry system, we’re confident that customers will be able to enter your event easily and see in the new year in style. Should any issues arise, we’ll work with you to ensure that customers are kept happy and want to attend your events year after year. Customers can take to Twitter or Facebook if they have any issues so even after our offices close we’ll be keeping an eye out for anyone who’s having last-minute ticket issues. We also do everything we can to make sure that customers retrieve their tickets in good time before the event and there’s lots of helpful info for them within our Help guide. This year we’ve also launched #SkiddleChristmas on our Customer Care Twitter. Each day in December we open a window to reveal a handy tip that’ll help ensure customers have a merry rave over the festive period. Most issues can be solved on the night but unfortunately, some customers leave it until after the event to let us know there’s been a problem. We do our best to keep customers as happy as possible so please ensure that you’re contactable before, during and after the event by keeping your details up to date. We’ll send any queries we receive to you via email and may place a hold on either the individual ticket funds or the account if we feel it’s necessary. Provide as much event information as possible on Skiddle.com so that customer’s know what’s what. Simply put, the more info you include then the less we’ll need to contact you! As you can appreciate we want to help them as much as possible but it’s going to be very busy. Encourage customers to self-serve. Most queries can be resolved by customers online at any time i.e re-send their ticket collection email, update details & transfer an order over to a different account, add tickets to Re:Sell or request a Cool:off refund. If someone arrives at your event without their ticket then a bit of help from door staff (checking their details with photo ID or their payment card) can mean their ticket can manually be redeemed within the app. If your event is cancelled, postponed or has changed venue. Action it! to stop customers from turning up to the event, which as you can agree would be very frustrating for them. Unfortunately, this can still happen and although we do our best to keep our finger on the pulse, we rely on you to make sure a cancellation is processed. More info on how to do this can be found here. Ensure that any queries are responded to as quickly as possible– We aim to resolve all queries within 48 hours so make sure your contact details are up to date, be contactable and responsive. We can appreciate that running an event is time-consuming and we’ll always do our best to find the answer for the customer at the first point of contact. However, on occasions, we may need to refer them over to you. TOP TIP ALERT! Advertise the last entry an hour before you actually need it to be. We’ve found that customers will push their luck with last entry times because they know that there can be some leeway. To solve this, simply advertise the real last entry an hour or two earlier and you’ll find that everyone will be in when you want them to be. As well as being available to speak to on the phone earlier, we’re also open on Boxing day and New Year’s day. 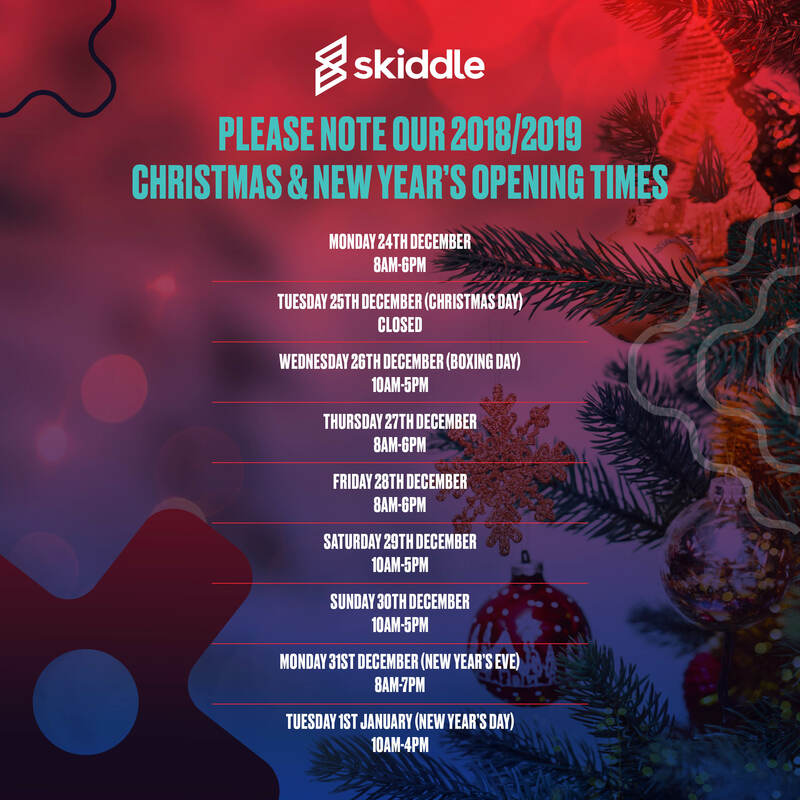 Our opening hours over the full Christmas and New Year period can be found here.